The centerpiece of new Zoo Boise Gorongosa Exhibit will be the E.O. Wilson Building, named in tribute to Wilson’s leadership and influence on conservation work in Gorongosa. 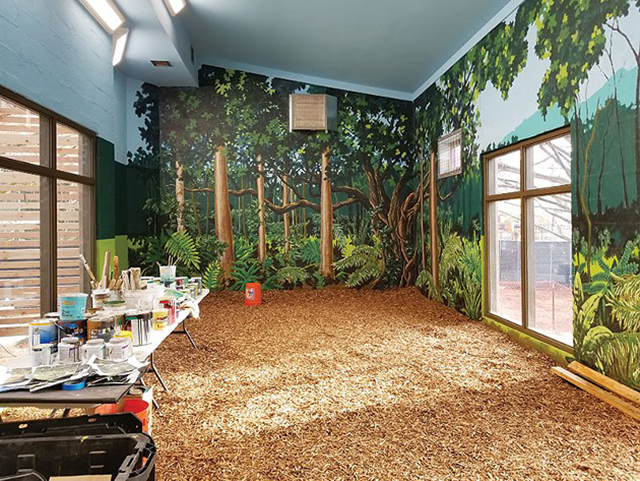 As he squished through the mud of the construction zone that would soon become the new Gorongosa National Park Exhibit, Zoo Boise Executive Director Gene Peacock shared this tidbit about animal enclosures: They all look bigger from the inside. Just a week before BW caught up with Peacock unsticking his boots from Zoo Boise’s soggy, post-snow soil, Boiseans had a chance to find that out for themselves when the zoo offered behind-the-scenes tours of its animal habitats still under construction. On Feb. 23 and 24, and on March 2, guides ushered groups inside the exhibits for one-hour tours at $25 a head. While they couldn’t see everything, they did get the chance to enter a few near-complete exhibits, look at usually off-limits transfer and holding pens, and take a gander behind the construction site fence. “Normally we try to do a preview where you can walk through behind the scenes of everything, but this exhibit is being designed where the buildings are going to get handed over to us in stages, and so we’ll be able to move animals in stages,” Peacock said as he trudged from site to site in his hard hat, dodging construction workers and swinging beams. The 1.5-acre Gorongosa Exhibit is a massive undertaking for the zoo, which plans to bring in more than 20 new species (African wild dogs, baboons, Nile crocodiles, otters, vervet monkeys, assassin bugs and warthogs among them) and relocate three others already in residence at the zoo (the African white-backed vultures, hyenas and East African crowned cranes) to fill it. The exhibit was inspired by Zoo Boise’s conservation partnership with Gorongosa National Park in Mozambique, a preserve in Africa’s Great Rift Valley that Zoo Boise supports with its conservation fund. Its centerpiece will be the E.O. Wilson building, named for a Harvard entomologist who spearheaded the conservation of Gorongosa. At roughly 6,000 square feet, it will be the largest structure in the zoo. Peacock said that partnership aside, Gorongosa is a species-rich area worth recreating in Boise. “There’s about 3 feet of mulch in these [indoor] exhibits. So they got to go in there and stand on it, and it almost feels like a bouncy house,” he said. The mulch is a more eco- and animal-friendly alternative to concrete floors. In addition to being easier on the animals’ joints, the choice also saves water. That’s just one example of the zoo’s attention to detail in the construction process. Another is the precautions it’s taking with the wire mesh enclosing each outdoor exhibit, which keeps digging animals like African wild dogs in, and native burrowing species like mink out. In an attempt to stay true to the animals’ natural habitats, the zoo even built one exhibit around a massive boulder. After pouring the foundation, Peacock said construction crews dropped the boulder in place and framed the entire building around it. Many of the exhibits will also get a final artistic touch, though it’s likely as much for the enjoyment of the humans as the animals. Walking onto the springy mulch of several indoor exhibits, Peacock pointed out Gorongosa jungle and savannah murals hand-painted by art students and faculty from Boise State University; a fitting complement to interactive animal masks crafted by local artist Melissa Chambers. Visitors to the finished exhibit will also enjoy videos of talks by Gorongosa scientists, live trail camera footage of Gorongosa and a replica of E.O. Wilson’s African lab, complete with shelves of specimen jars. The grand opening the Gorongosa Exhibit and two other newly renovated areas of the zoo is set for Wednesday, July 17. At the height of the Idaho summer, it’s a good bet the African animals will feel right at home.